WEEK 42 compliments my website @ Robert Craig Online as well as my own personal interests. Either use the search box below to find what you’re looking for or click on any of the links in the category cloud. Please note that the ‘Newspaper’ and surname categories only pertain to entries relevant to my own family. In 1903, Clara Simpkin (my great great aunt) married Albert Jennett and together they issued five children. Albert was born in 1879, in Sheffield, and served in World War One. Albert was awarded the Distinguished Conduct Medal for bravery displayed at Gallipoli in April 1915 and was himself wounded just three months later, but fortunately recovered. Sadly, Albert was killed in France on 21st March 1918. Albert was serving with the 97th Field Coy Royal Engineers and was positioned within the forward line of the British defence, in anticipation of the German offensive from the Hindenberg Line in 1918. On the 21st March 1918, following a massive bombardment, including gas shells, aimed not at the infantry, but at targets of British HQ’s, communication and supply, artillery and engineers, the Germans attacked with their ’stormtroopers’ recently brought from the Eastern Front. They attacked in small groups intending to break through pockets of resistance, thus allowing the infantry to easily follow. The forward line of British soldiers were quickly overwhelmed and many casualties sustained. 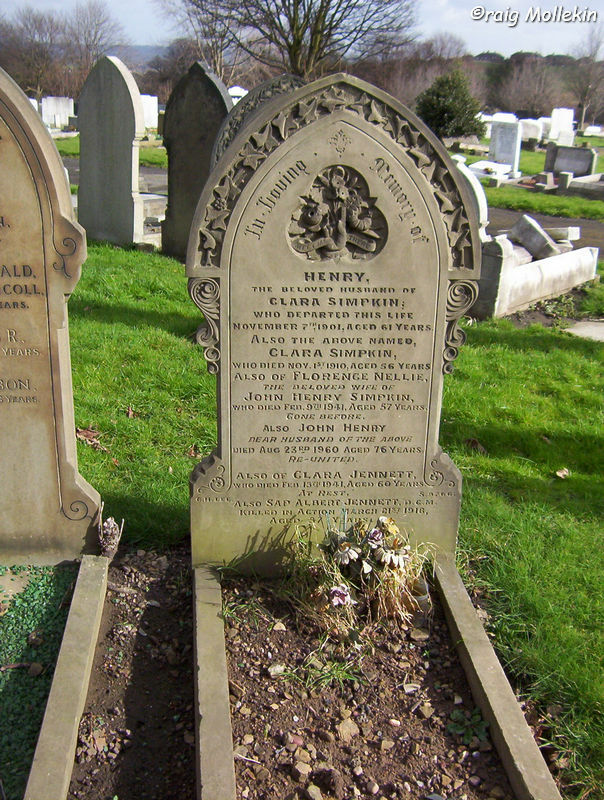 Albert is buried in the Gouzeaucourt New British Cemetery in France but is also remembered on the headstone of my great great grandmother (Clara Simpkin (nee Loukes)) in City Road Cemetery, Sheffield. Below are three newspaper snippets which pertain to Albert’s military career. 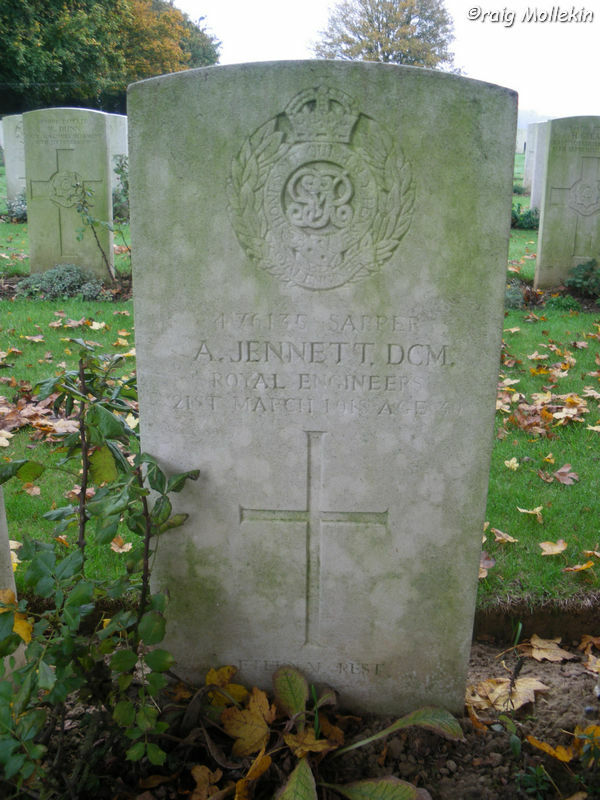 The engineers have been in the Dardanelles operations and Sapper A. Jennett, of the West Riding Field Co., R.E., is among the wounded. Sapper A. Jennett, 1st West Riding Field Company, Royal Engineers (T.F.) – For great bravery on the 28th April, 1915, on the Gallipoli Peninsula. An officer of the Argyll Mountain Battery had had his leg blown off and was lying in the open exposed to a heavy fire. Sapper Jennett, with the assistance of another man, voluntarily went out, crossing over a very difficult wire entanglement under heavy fire, and succeeded in bringing him to safety. He gave a conspicuous example of courage and self-sacrifice. SHEFFIELD SOLDIERS WHO WON THE D.C.M. Sapper A. Jennett, whose wife and five young children live at 12 Hadfield Terrace, off Hadfield Street, Walkley, rejoined the Sheffield Engineers, in which he had served for many years, on the outbreak of hostilities. He is a machine filecutter, and was in the employ of Messrs. Samuel Osborn and Co. Limited, at their Brookhill Works. Sapper Jennett went out to the Dardanelles in March, and is at present in hospital in Cairo. He was wounded in the thigh on July 11th by a piece of shrapnel while in the act of mashing tea. He is progressing favourably. His father, Mr. John Jennett, file forger, of Robertshaw Street, Sheffield, was a volunteer for several years. Enter your email address to follow Week 42 and receive notifications of new posts by email.